Explanation: Happily, skies over Connelly's Springs, North Carolina, USA were not mostly cloudy, as forecast, on the evening of November 8. In fact they were mostly clear early on, allowing photographer David Cortner to record the evening's scheduled celestial entertainment, a total lunar eclipse. Cortner took telescopic pictures of the Moon every eight minutes as it entered partial eclipse around 6:30pm EST and progressed through the reddish total eclipse phase while rising higher in the sky. Near the end of the eclipse he also recorded a wide-angle view in a long exposure, bringing out the thickening clouds and a landscape silhouetted by still partially eclipsed moonlight. 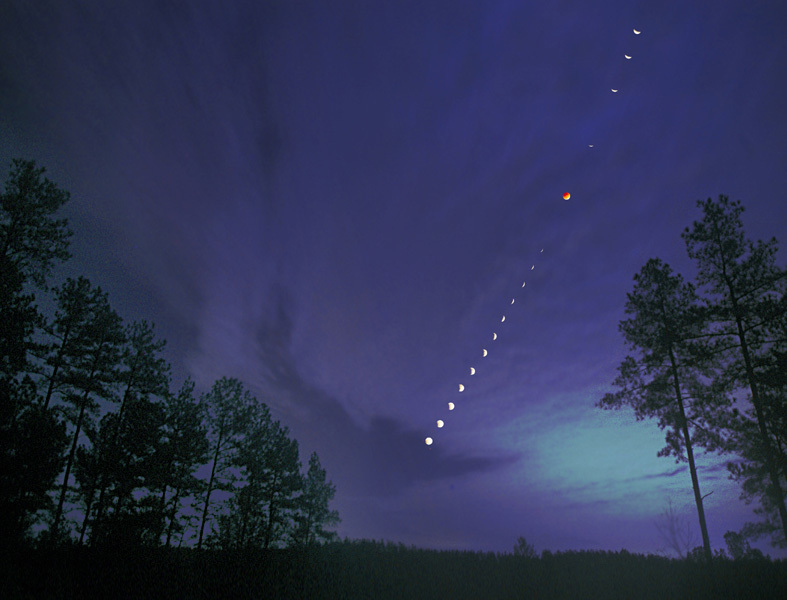 Later, the telescopic views were carefully combined along the Moon's trail through the wide-angle image to create this dramatic composite eclipse sequence.